Yangmei (杨梅), sometimes also called Yang Mei Berry, Chinese Bayberry or Waxberry, is not a fruit frequently available in Singapore. This is an interesting fruit the size of a large cherry with a knobbly surface. 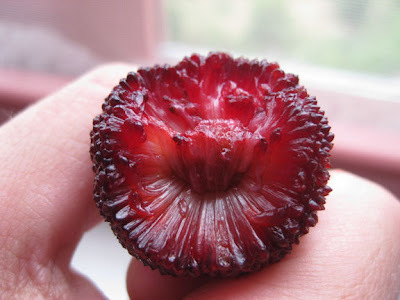 The surface of the fruit is a deep red, almost purple. The flesh color is similar to surface color but somewhat lighter. The flesh is tart but sweet, with a single seed in the centre of the fruit. I first came across Yangmei as a child, when my late grandfather brought home some fresh and dried ones from China. I was initially put off by the fruit, because Grandfather said it was prone to have worms and needed to be washed properly, with salt water. But then Grandfather said they was delicious and gave me some to try. I remember they were pretty good! After that time, the next time I had Yangmei was when I was living in Beijing. These were usually available in summer, and not for very long periods of time. Yangmei has a short shelf life just like raspberries, and has a very short growing period of just 2-3 weeks. The Husband and I came across Yangmei quite by accident on Saturday and decided to buy a box home. I wished we brought home a few more boxes. These are the best Yangmei I've ever eaten - fleshy, juicy, tangy yet very very sweet. Yangmei is a really healthy fruit - loaded with vitamin C and high in antioxidants. Do give them a try if you come across them! Oh, I used to eat a lot of the preserved ones when I was young. O yes! I love fresh Yang Mei! Tried my first fresh YangMei when I was in China years ago. Cant stop eating it... I really miss it. Ting, me too.. I ate some home made preserved ones my China relatives made as well! They look so juicy! I wish I have delicious fruit trees in my garden! They look like a tree I saw in a garden in Orange Co. CA. Now I wish I had asked about it. Oh.. I always wonder how the yangmei tree looks like!